With the exception of the occasional kofta or vat of chili, it’s not often that you’ll see me using ground meat as a base for recipes- no Hamburger Helper-type menus in this household. But my dad gave me several pounds of ground venison a few months ago and I’ve been working my way through them, trying new things and expanding my ground meat repertoire. My first two installments of the Venison Diaries were more experimental, but this time I decided to go thoroughly retro and make a meatloaf. 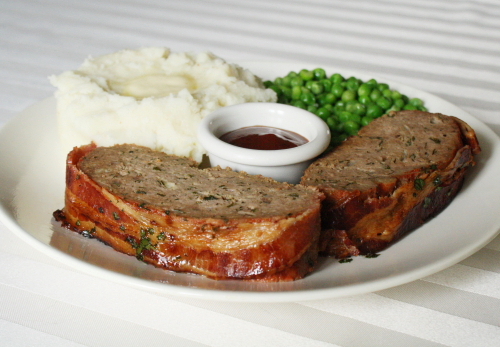 I figured as long as I was making meatloaf I may as well go totally traditional in my side dishes as well, so I made some mashed potatoes and peas. I can probably count on one hand the number of times I’ve made mashed potatoes, but I do own a potato ricer, which I put to use on some white Michigan potatoes for an unbelievably light and creamy result. The potato ricer is, yes, an extra step and an extra item to wash, but the difference is well worth it. I wish I had made a bigger batch! Even though this wasn’t a typical type of menu for me, Marvin and I both really enjoyed it and I would definitely make it again if and when I get another venison windfall. *I was disappointed not to find anything on the Nueske’s website about how their pigs are raised. The only info I could find online was that the pigs Nueske’s uses are “raised to their specifications” in Iowa, North Dakota, South Dakota and Canada (not in Wisconsin, where the company is located) and fed a diet of a barley and corn mixture. Make the glaze: Combine all ingredients in a small saucepan and stir over medium low heat until the sugar has dissolved. Set aside. Heat the oven to 350°. Heat the oil in a medium skillet. Sauté the onion & garlic over medium heat until softened, about 5 minutes. Set aside to cool. 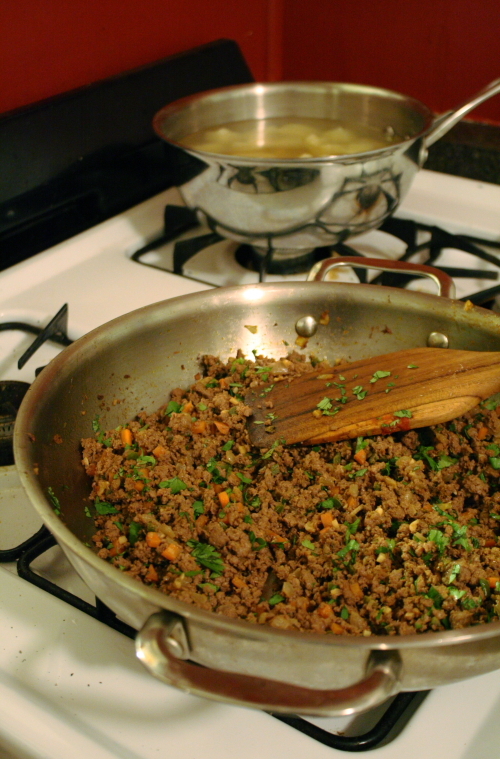 Place the meat mixture on a work surface. Wet your hands and pat the mixture into a loaf shape, approximately 9″ x 5″. Place the loaf on a foil-coated rimmed baking sheet. Brush the loaf with half the glaze (be sure not to double dip your brush since you’ll be serving the remainder of the glaze). 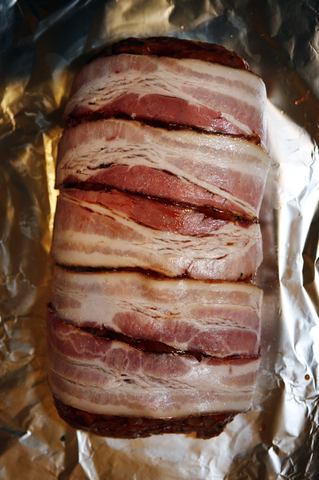 Arrange the bacon slices crosswise over the top of the loaf, tucking the ends underneath. Bake until the bacon is crisp and the internal temperature registers 160°, about 1 hour. Let rest 15-20 minutes before serving. Warm the remaining glaze and serve on the side. 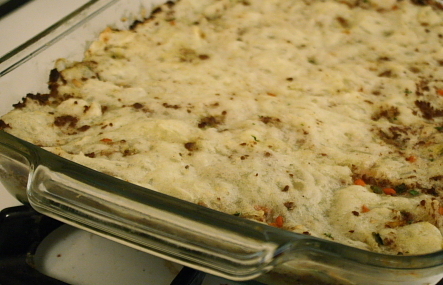 I call the dish “shepherd’s pie” because that’s the closest thing I’m reminded of, with the seasoned ground meat being cooked under a layer of starchy veg. The yuca is quite a bit different than potato in that it is very dense and has a lot of “chew” to it. When you mash it, it holds together almost like dough, and when it’s baked, the top gets a nice crunchy texture. Even if you don’t follow this recipe, I would encourage you to play around with yuca because it’s a fun and unique starch. 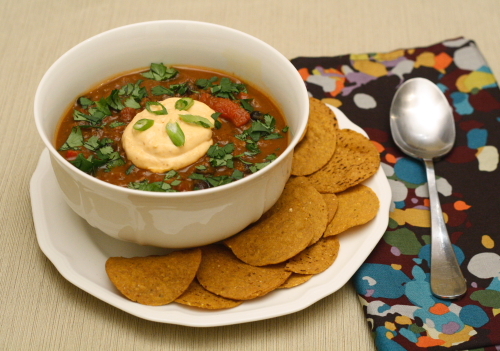 My photos were not taken in the greatest lighting, so this may not look like the most attractive dish, but it’s easy and homey and familiar yet exotic all at once. By all means, if you’re not a fan of venison, use ground beef like Marvin’s mom does; my use of venison was just because that’s what I had. 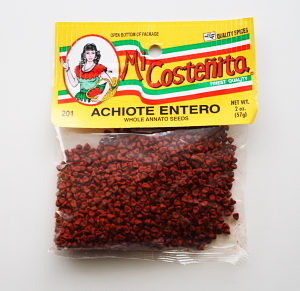 This was also the fist time I had used achiote (aka annatto). 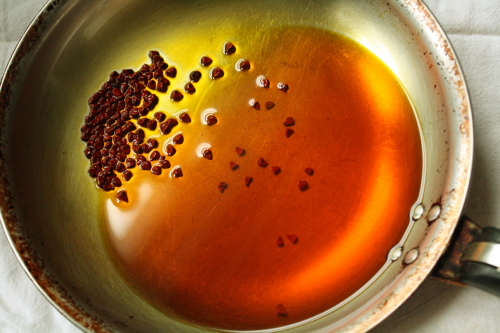 I used the whole seeds to flavor some canola oil, which I then used to saute the vegetables and meat. 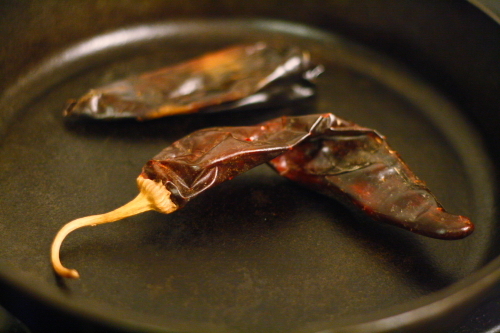 To make achiote oil, just warm some neutral oil in a skillet (I prefer a silver skillet so you can see the color). 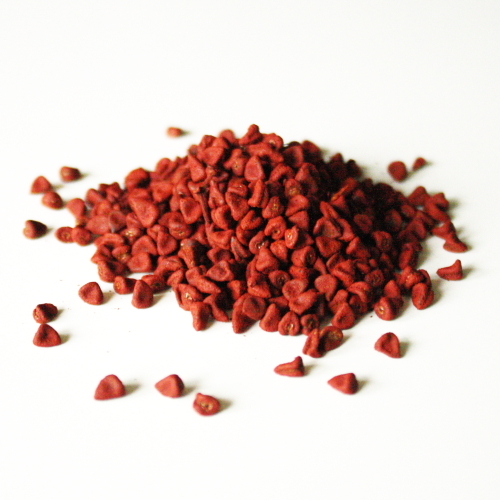 Add some achiote seeds and gently swirl the oil until it reaches a deep orange color and becomes fragrant. 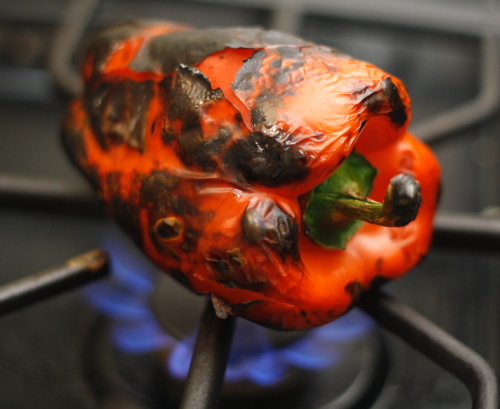 Don’t let the oil get too hot or the seeds will burst and become bitter. Strain the oil before using. Put a large pot of well-salted water to boil. Cut the yuca lengthwise and then into chunks of roughly equal size. Add the yuca, garlic, onion, and a few grinds of pepper to the water. Let simmer, covered, for an hour. Check the yuca by cutting or smashing a piece- it should be a pale yellow and have no opaque white spots. You may need to cook the yuca for up to 90 minutes to get it fully cooked through. When the yuca is done, remove with a slotted spoon and discard the garlic, onion and cooking water. There will be a tough stringy core in the center of the yuca that you should easily be able to remove with your fingers. 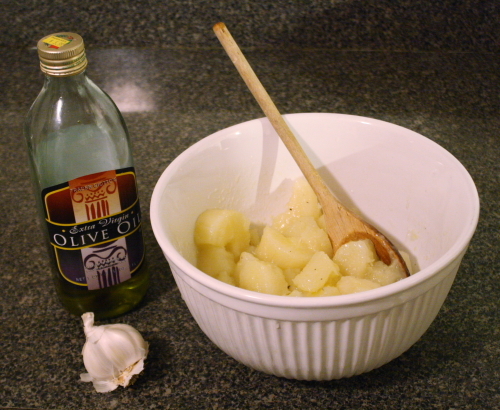 Place the yuca in the bowl of a stand mixer and use the paddle attachment to mix the yuca into a smooth paste, adding the olive oil in a thin stream. 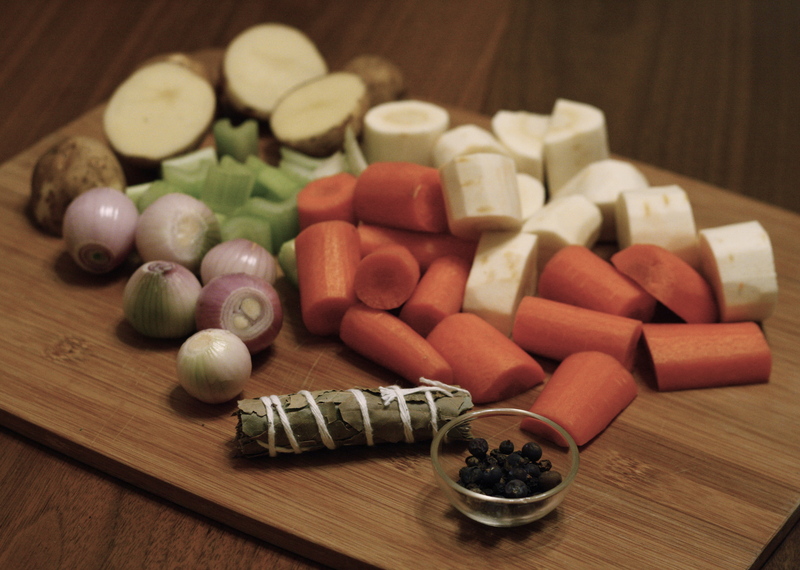 Start with 1/4 cup and add more if needed, based on the taste and consistency of the yuca. Taste for salt, adding if needed. While the yuca is cooking, prepare the meat: Heat 2-3 Tbs oil in a large skillet over medium heat. When hot, add the onion, garlic and carrot. 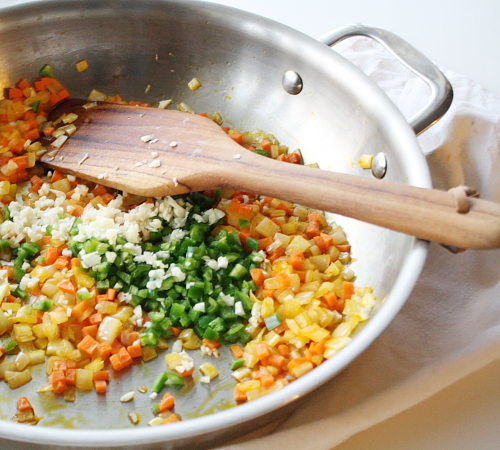 Cook for a few minutes until the onion & carrot begin to soften; then add the peppers. Cook for a minute longer and add the meat, cumin, 1 tsp salt and a few grinds of pepper. If you’re using venison you may need to add a bit more oil to prevent sticking. Cook the meat, stirring frequently, until it is fully browned and cooked through. Stir in the tomato paste and cilantro. Taste for salt and adjust as necessary. (if that’s not enough to cover the bottom you can use a little more; just make sure to reserve more than half for the top layer because it’ll be harder to spread). The yuca will be very sticky so it may help to lightly oil the spatula. Dump the meat in a layer over the yuca (if using beef, you may want to use a slotted spoon to drain off some of the grease). Spread the meat in an even layer, pressing it into the yuca. Take the remaining yuca and spread it over the meat. You may need to use your hands to spread and press it down; if so, you’ll want to oil your hands first. (Looking at my photos, you can see it was a challenge to get the yuca all the way out to the sides!) Lightly brush the final layer of yuca with olive oil. 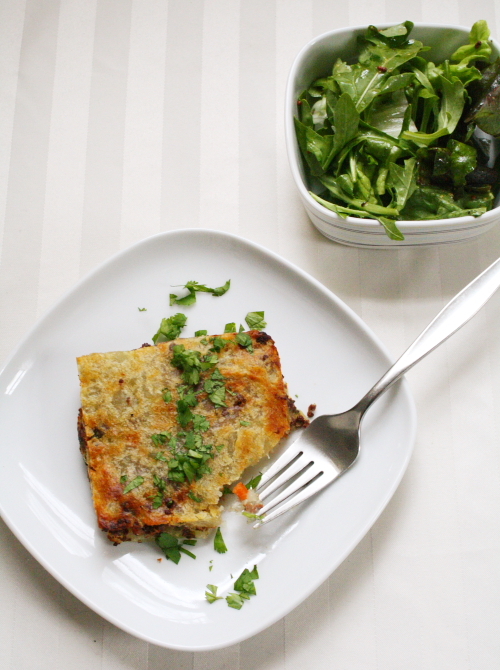 Bake the casserole for about 30 minutes or until the yuca starts to become crisp and brown. If after 30 minutes the yuca is not browning, you can run it under the broiler for a minute or two to get a nice crunchy top. 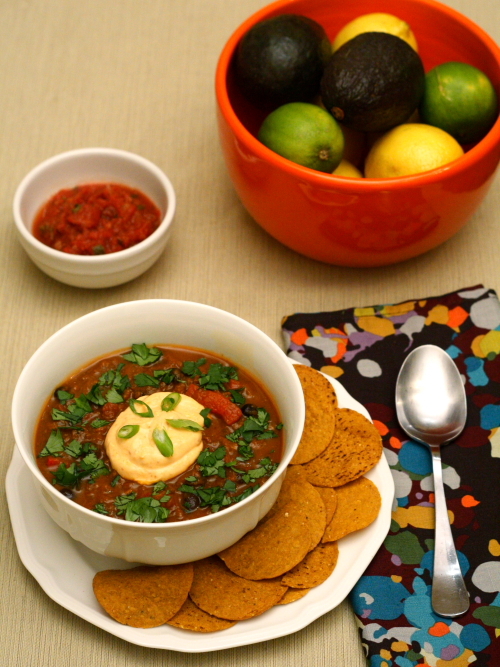 If you have any cilantro left over, you can use it as garnish. My dad grew up on a Michigan farm, and has been hunting for most of his life. Even though he has a decidedly white-collar profession and hasn’t lived anywhere near a farm in decades, he still enjoys going deer hunting every chance he gets. I would often go hunting with him as a little girl, practicing with a toy bow and arrow set in the backyard and eagerly looking forward to being old enough to get my hunting license. Of course, by the time I actually reached that age, we had moved to suburbia and I was more interested in my sticker collection than hunting. But I still have fond memories of the one-on-one time spent enjoying nature and my dad’s company. Ironically, although I enjoyed the hunting excursions, I hated venison as a kid. My mom would try to sneak it into recipes, but we always knew what it was and there was lots of whining at the dinner table on those occasions from myself and my siblings. Luckily, my tastes have matured and I now enjoy venison quite a bit. It doesn’t have the ferrous aftertaste I recall being turned off by as a kid- I don’t know if it’s a matter of kids having more “sensitive” taste buds, or if the venison I’ve had recently just happens to be milder due to the deer’s diet. Whatever the case, I have been enjoying the bounty that has been thrown my way- my dad has gotten 8 deer so far this year, and sent me home from my Thanksgiving visit with a couple packages of salami sticks and about 6 lbs of frozen ground venison. My goal is to create 6 different recipes and blog about them all- I figure I can’t be the only one with a bunch of venison in their freezer, and perhaps people are looking for some new ideas. I’d like to create recipes that compliment venison’s unique flavor, rather than try to mask it or pass it off as a ground beef substitute. With that in mind, I present you with this first installment in “The Venison Diaries”. I made an Italian-style ragù (i.e. meat sauce) using techniques from The Splendid Table, enhancing the earthy flavor of the meat with cognac and porcini mushrooms (or cèpes, for all you francophones). Venison is an extremely lean meat, so don’t feel guilty about the pancetta and butter in this recipe! 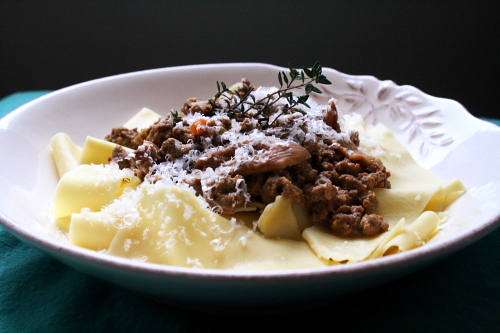 I also added a smidge of ground pork and veal to round out the flavor and texture, as ground venison can tend to be a bit dry and crumbly on its own. Simmering the meat in milk, as in some versions of the classic sauce Bolognese, also helped keep things tender, and gave body to the sauce. The results were just as I’d hoped- deeply savory and rich, and perfect with thick noodles and a sturdy red wine. Notes: If you don’t have all the fresh herbs and don’t want to spend the money, I’d at least go with the thyme. If you don’t have cognac you could substitute red wine and just use a bit more, like ½ to ¾ cup. But a little cognac is always a good thing to have on hand for impromptu pan sauces or the occasional after-dinner nip. Directions: Bring about 2 cups water to a boil. Place dried porcinis in a bowl and pour the boiling water over them. Cover and let stand for at least 10-15 minutes. When mushrooms are softened, remove them gently so as not to disturb the grit at the bottom of the dish. Set mushrooms aside and strain the soaking liquid through a coffee filter; reserve 1½ cups. 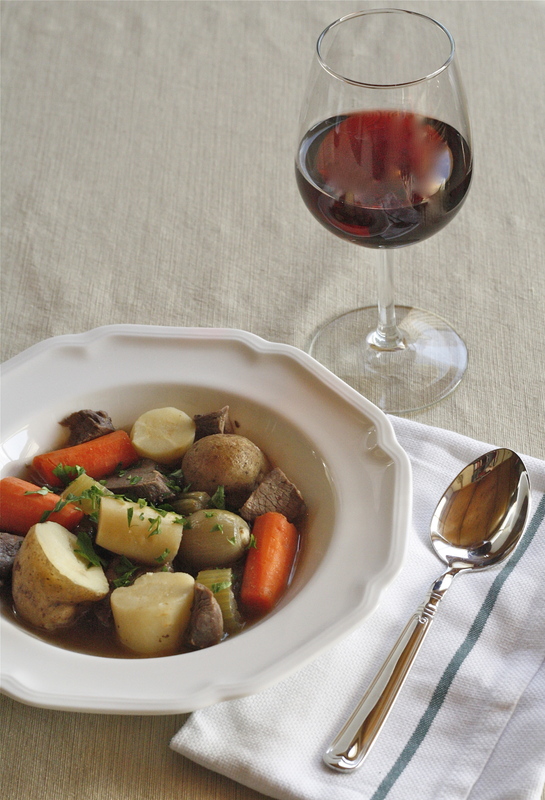 Place the venison, pork and veal into a large bowl. Season generously with salt & pepper and mix with a wooden spoon until the meats are well incorporated. In a large skillet or Dutch oven, sauté the pancetta over medium heat for a few minutes until it begins to render some of its fat. Add up to 1 Tbs butter as needed so that there is enough fat in the pan to cook the vegetables. Add the shallot, carrot and celery and cook until the carrots begin to soften, stirring often. Increase the heat slightly and add the meat to the pan. Cook the meat, stirring and breaking it up gently, until you no longer see any liquid in the bottom of the pan; this could take up to 15 minutes. Reduce heat slightly and cook for a few more minutes to give the meat a chance to brown. Stir in the tomato paste, herbs and mushrooms. Add the cognac and simmer until the liquid has evaporated, stirring and scraping the bottom of the pan to deglaze it. 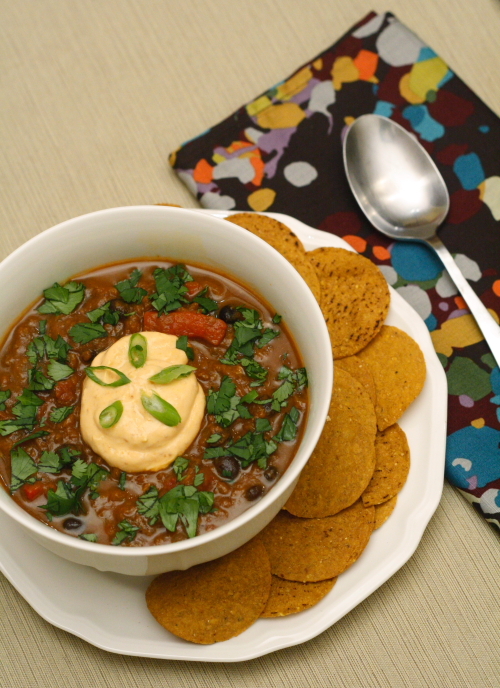 Add the mushroom broth ½ cup at a time, letting it cook off before adding more. Add the milk and simmer gently, uncovered, for about 30 minutes or until the sauce has thickened enough to coat a noodle. Taste for salt, adding as needed. 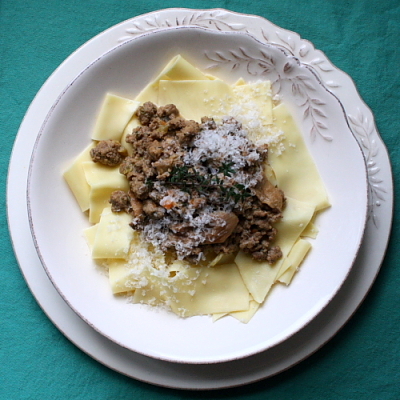 Serve over tagliatelli or egg noodles with a dusting of cheese and a pinch of fresh parsley.